The Offer Kathy Peterson Refused 6000 A Month And Drop Out Race Against Pscs Oden » Mr. Dunn Goes to Montgomery | Who's Behind the Mask? 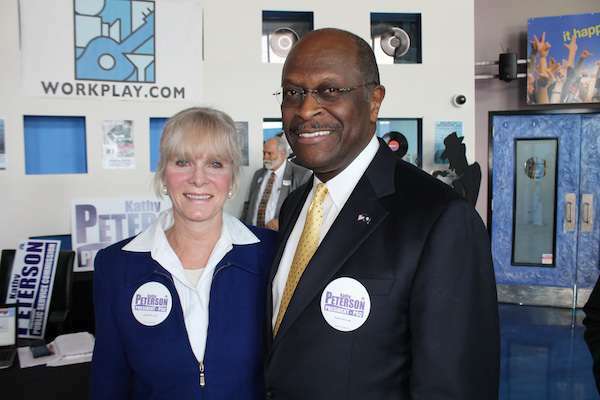 Former presidential candidate and Tea Party favorite Herman Cain came to Alabama in 2012 to campaign for Kathy Peterson, who was running for president of the Public Service Commission. Peterson was defeated by Twinkle Cavanaugh. Author Disclosure: In April (2014), I donated $125 apiece to incumbent Place 2 Public Service Commissioner Terry Dunn and Peterson — the first campaign donations of my life. It’s been the position of this web-site that the PSC should be governed as state law dictates — that is to say, by commissioners who favor neither ratepayers nor the utility monopolies whose prices they regulate. The PSC is required to make decisions much as a referee makes calls in a football game — with no favor given either side. Should Dunn and Peterson win their respective June 3 primary races — a long shot — I believe the Alabama PSC will bring Alabama Power’s astonishing profit levels closer to national norms, with resulting rate reductions. I also like to think it would have a chilling effect on Alabama Power’s use of bully tactics to control the PSC, naive as that sounds. On Feb. 5, Kathy Peterson announced that she had filed the requisite papers and would be challenging incumbent Public Service Commissioner Jeremy Oden in the June 3 Republican primary. 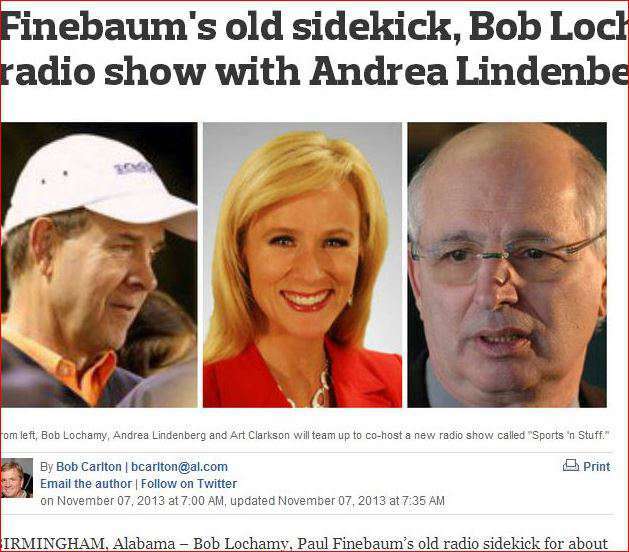 The man was Bob Lochamy, for years the sidekick to Paul Finebaum on the latter’s wildly popular sports radio call-in show. Lochamy is still in radio, and also runs a small media relations company, Lochamy & Associates, that serves private and political clients. 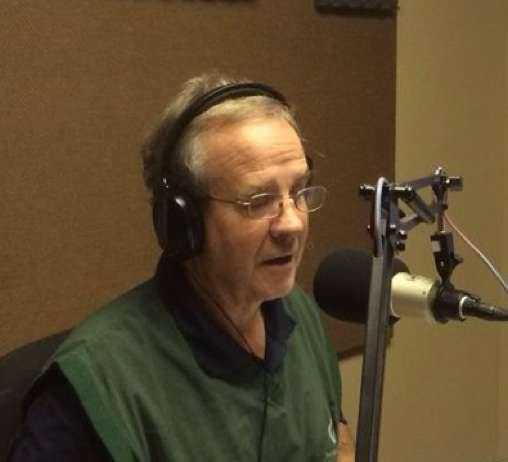 Bob Lochamy, on the radio. She (Peterson) released emails showing that Birmingham media consultant Bob Lochamy offered her a $6,000-a-month job with an advocacy group he was planning to start called the Stand Up for Alabama Coalition, but the one condition was she had to drop out of the PSC race. “If they can buy this office, then they can continue to buy it from now on,” she said. “It’s pretty paranoid to say something like that,” Lochamy said. He said he made a legitimate offer for a job that would last two or three years, and it made no sense for Peterson to be the full-time spokeswoman for the group if she were also running for public office. I was flabbergasted. In a race this important — with the future of the PSC hanging in the balance — a sudden job offer to a candidate conditioned upon her dropping out of the race? Lochamy could say that Peterson’s had to be “pretty paranoid,” to see it that way, but from the few facts presented in the AP story, her view seemed reasonable. Bob Lochamy, possible future co-chairman of the Stand Up for Alabama Coalition. I contacted Peterson to ask if she would provide me with the e-mail correspondence between herself and Lochamy. She forwarded the e-mails, along with a timeline of events that appeared consistent with the e-mails. Lochamy doesn’t deny sending the e-mails. Lochamy first made contact with Peterson on Feb. 24. He told her he was forming an organization to spread conservatism in Alabama and was looking for a female co-chair. 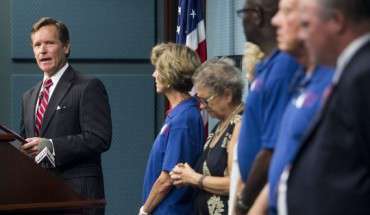 Numerous people had recommended Kathy for the position, Lochamy said. They agreed to meet two days later later at The Egg & I, a restaurant in Hoover. Stand Up For Alabama Coalition is a coalition of concerned conservative citizens and their families, organizations, and freedom-loving “‘patriots” who are sick and tired of seeing our state and nation be threatened by liberal extremists. Alabama is a conservative God-fearing state. We cherish our freedoms and the protections that are provided by the United States Constitution. Whether it is to be able to worship God, own our guns, speak our minds, protect our families, or make sure that Alabama school children are taught the values we hold dear, we can no longer stand by quietly, and let the protection of our rights be eroded and taken away. Stand Up For Alabama Coalition will be meeting with like-minded individuals and organizations around the state, speaking to citizens groups and youth organizations, and holding news conferences to advocate for the freedoms we hold dear. For information contact Bob Lochamy, Co-Chairman of the Stand Up For Alabama Coalition. The coalition will be expanding it’s leadership, staff, and membership in the coming days and will be please to speak to your group or discuss ways we can work together with you to protect our valued rights and freedoms. Kathy Peterson is well-known as a Tea Party activist. The mission statement could be viewed as having been tailored to match her politics. 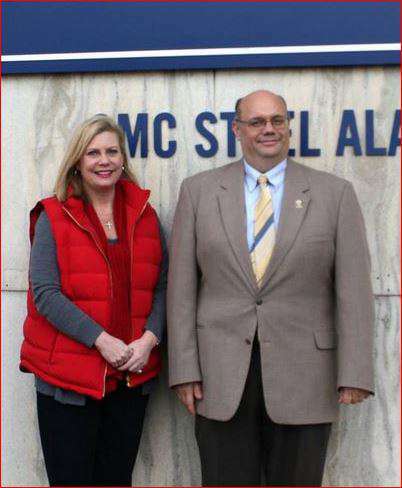 Alabama Power’s Dynamic Duo: PSC President Twinkle Cavanaugh and Jeremy Oden. 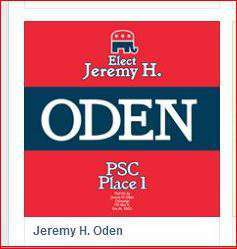 If Oden defeats Peterson, Alabama Power will be assured of retaining control over the PSC, regardless of whether Terry Dunn wins of loses, as Cavanaugh has two more years left in her term. The next day, Lochamy met with the Peterson’s for a long breakfast. He went into detail about his proposal. Near meeting’s end, according to Peterson, Lochamy told her he thought that it would be too much for her to handle, both working with Stand Up For Alabama Coalition and running for the public service commission. She said she told him that she had committed to run and could not break that commitment. He asked her to at least consider quitting the race. Peterson’s husband is Dale Peterson, who is running for state auditor. Dale Peterson made quite a splash some years ago with his rifle-toting ad during his campaign for state agriculture commissioner. Kathy Peterson said that when she told her husband about the meeting, he immediately suspected it was a “set-up” designed to get her out of the race. He told her she should reject Lochamy’s offer. Lochamy, according to Kathy Peterson and his e-mails, told her he was interviewing several candidates for the position, and he was under the gun. He had to make his final recommendation to his backers by week’s end. Early the next morning, Lochamy e-mailed to tell Peterson how much he’d enjoyed meeting her. Lochamy is still dabbling in radio, with a once a week sports talk show on “The Peach” radio station. However, business and life experiences had taught her to be “resistant to spur of the moment decisions.” There were multiple factors she had to consider “before giving you an answer as to whether or not I will be able to roll,” she wrote, using Lochamy’s phrase. A. I made a commitment to the people of Alabama to challenge Place #1 for Public Service Commissioner. I gave my word. B. I have, within the past year, made a very serious commitment both in time and financially to a real estate path. C. I do not have a definitive understanding as to exactly what Stand Up For Alabama Coalition is or exactly where it is headed and exactly what it hopes to accomplish. D. There are no apparent assurances of longevity of the coalition. Will funding be around next year, or even next month? E. As I see it, the monetary compensation for me for this position falls far short considering the amount of work and time I perceive it would take to successfully accomplish the task. F. How is the compensation to be paid, by whom and in what form? Is it tax free or paid as contract laborer, or what? G. Travel, lodging, car, office, etc. are to be paid for how? H. If I am to take on this responsibility for the people for the State of Alabama and for the people who are willing to fund such a venture, then it is imperative I know for whom I am working. I. I do not have a grasp as to the urgency for me to drop everything that I have in my personal pipeline at this moment. What is to be accomplished in the next 90 days that calls for such action on my part? Lochamy replied within two hours. Consistent with is approach, he ladled on the flattery. “Kathy, you make my day with the depth of your reply,” he wrote. Kathy Peterson points down — the direction she says utility bills will go if she’s elected. Peterson’s ad is on YouTube, and has run some in the Dothan area. Unlike Oden, she doesn’t have enough campaign money to run it statewide or with frequency anywhere. I had called Lochamy, and we ended up trading multiple e-mails. He was, I will note, most gracious and friendly in the e-mails. In one, he asked me to provide advice to him for Stand Up For Alabama when it got off the ground. I responded that I appreciated the offer but that, truth be known, its purposes were a bit too conservative for my blood. My problem with Lochamy’s responses — and I told him this — was that he repeatedly blamed Dale Peterson. Dale Peterson, as a result of the rifle ad and some other issues, is an easy target. And Kathy Peterson disputed Lochamy’s characterizations of her husband’s behavior. She said that Lochamy was “giddy” during the second meeting and that her husband “quizzed Lochamy repeatedly” about financial issues related to the job offer. One of the “Likes” on Lochamy’s Facebook page. I told Lochamy that, rather than get into a he said/she said situation, I’d stick as close as possible to the e-mails. Three days after the second meeting, Kathy Peterson and Jeremy Oden spoke to the Republican Women of Huntsville. During her talk, Peterson told the gathering that there had been an attempt to get her to drop out of the race. As described at great length in his e-mails, the primary purpose of Stand Up For Alabama Coalition was to serve a a bully pulpit — to hold press conferences, meetings, to rouse the public and make noise for the conservative issues it supported. It’s now almost three months since that e-mail. Still, no such organization has been incorporated, started a web-site, a Facebook page, anything. And Lochamy still won’t disclose backers of an organization. One would think that deep pocket conservatives would have no problem declaring their backing of such a group, especially to a woman in the midst of being courted to serve as one of its top two officials. Even she was kept in the dark. This is what Lochamy wrote in response to my questions about the continued non-existence of Stand Up For Alabama Coalition. And what of the co-chair that he and Stand Up’s coalition had selected, as he’d declared in his final e-mail to Peterson? Lochamy said that, prior to contacting Peterson, he had chosen another candidate. However, personal issues prevented that woman from going forward, thus his recruiting effort with Peterson. After Peterson declined to serve as his “passionate partner” co-chair, Lochamy went back to his first choice. She “was receptive to accepting my offer to be my partner but that she felt that she needed a bit more time to reconcile her personal issue before she could join me in forming Stand Up For Alabama,” he stated. “Based on my desire to have this individual be my active ‘boots on the ground’ partner and the short timeline that then existed before the upcoming primary elections, I decided that it would be best if I held up launching Stand Up For Alabama until around late August or early September,” he wrote. 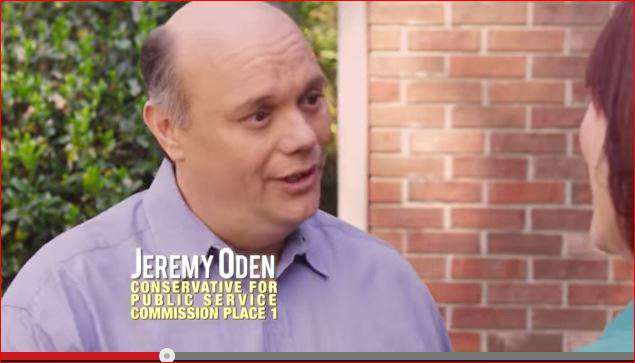 Did Jeremy Oden or anyone with his campaign know about the effort to hire Kathy Peterson? I don’t have a clue. Peterson, though Oden’s foe, suspects her opponent was unaware of Lochamy’s efforts to get her to drop out of the race. “Bribes at this level are probably done by the decisions makers of the special interests who had the most to gain by me dropping out of the race. In my opinion, at that point, Oden didn’t need to know,” she said. Lochamy, needless to say, denies any involvement with Oden or any one else working on Oden’s behalf, and strongly disputes any characterization of his offer as a bribe. “Paranoid” is how he characterized Peterson’s accusations when asked by the AP’s Phil Rawls. I did not contact Oden because I am certain that neither he nor his campaign would respond. I do think it would be an interesting question for someone in the state media to pose, but see that as unlikely to occur. Was Lochamy acting on behalf of people or a company or companies that wanted Peterson out of the race in order to ensure Oden stays remains in office? 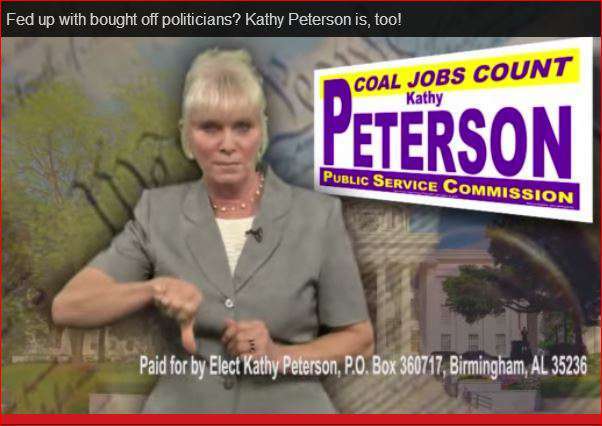 Prior to Lochamy’s effort to recruit Kathy Peterson, Oden had received a decent amount of campaign donations, much of it from coal interests. Utilities, as you may know, are prohibited from contributing to PSC campaigns. 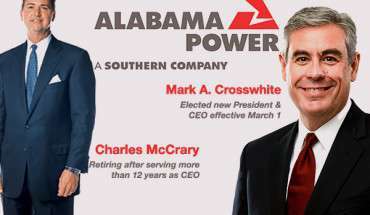 The coal industry, including Drummond Coal, the Alabama Coal Association and related groups, have a long history of playing stand in for Alabama Power at campaign time. You can always tell who Alabama Power wants to win by looking at which candidates are receiving coal money. This year, Alabama Power’s candidates are Chip Beeker against Dunn, and Oden vs. Peterson. In April, Oden’s coffers swelled with contributions, much of it tied to coal. That month his campaign took in $287,000. As a comparison, Gov. Bentley’s campaign received some $294,000 that month. House Speaker Mike Hubbard — the second most powerful politician in the state — took in about $17o,ooo in April, more than $100,000 less than Oden. And Hubbard, too, has a primary opponent. Here is a page from Oden’s Aprl campaign report. 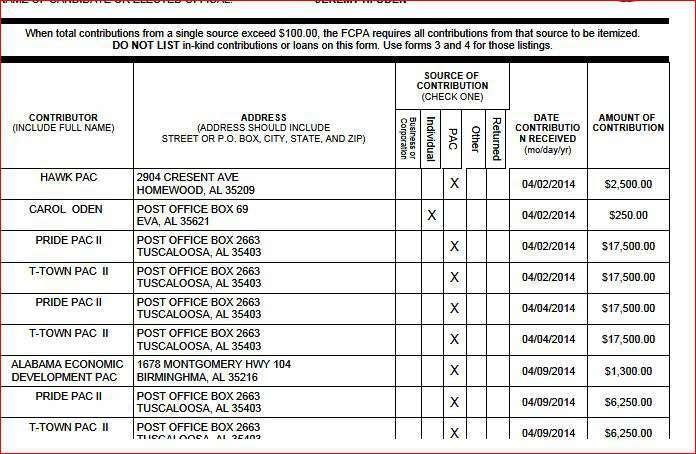 He’s received well over $200,000 from two PACs — Pride PAC II and T-Town PAC, that are operated by Mike Echols of Tuscaloosa. The two PACS have also given heavily to Terry Dunn’s opponent, Chip Beeker, and donated $12,500 apiece to Coal Jobs Count, the upstart organization that’ seems to exist solely to bash Dunn. The two PACS have received substantial sums from coal interests and other Alabama Power vendors. One of the PAC’s also paid Alabama Power’s political consulting firm, Matrix LLC, more than $5,000 for polling services. 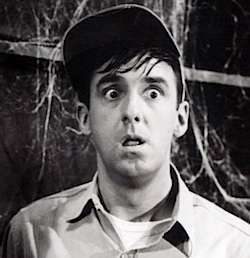 Inspiration for future Stand Up For Alabama Coalition blog?